Are you involved in engaging research at the Open University? Have you been involved in an engaged research project that you want to share? Why not enter the Open University’s 2nd Engaging Research Awards Scheme? The OU’s RCUK-funded Public Engagement with Research Catalyst team, ‘An open research university’, is running a second round of this Awards Scheme to find and celebrate high-quality engaged research at the OU. For details of the winners of the inaugural Awards Scheme, select: Inaugural Engaging Research Award Winners. Across the OU researchers are engaging with publics, user communities and stakeholders in lots of different ways and for lots of different reasons. Through this scheme we want to recognise and reward examples of this top quality engaged research in practice, and we want you to get involved. Engaged research encompasses the different ways that researchers meaningfully interact with various stakeholders over any or all stages of a research process, from issue formulation, the production or co-creation of new knowledge, to knowledge evaluation and dissemination. Stakeholders may include user communities, and members of the public or groups who come into existence or develop an identity in relationship to the research process. A judging panel will shortlist finalists who will be invited to an awards ceremony at the Open University in Milton Keynes at lunchtime on 3 February March 2015. 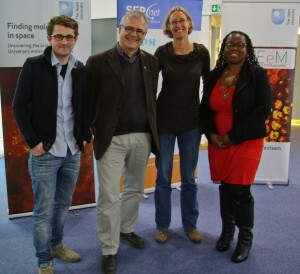 The winners will be supported in communicating their engaged research within the OU and externally. The awards scheme will be open to all current, ‘active’ Open University researchers, including postgraduate researchers (full-time, part-time and those based in Affiliated Research Centres). Applications are also welcomed from Research Leaders (e.g. Principal Investigators or Co-Investigators), and from Early- and Mid-Career Researchers. Entries from academic members of staff require sign-off from your Associate Dean, Research (or equivalent). Postgraduate Research Student entrants should have successfully completed their Probation Review. Sign off from your supervisor(s) is also required to ensure satisfactory progress. Applications from partners in collaborative projects are encouraged. However, the named applicant should be a current Open University researcher or postgraduate research student. The scheme is open to individuals or groups but group entries must be submitted by one named individual who is the main contact for the competition. All partners should agree to the entry into the competition and be acknowledged in the entry. Collaborations with other HE/Research institutions are eligible but the named individual, who is the main contact for the competition, must be an Open University researcher or postgraduate research student. The activity must have taken place within the last three years or be ongoing (depending on the nature of activity). The activity must be an example of engaged research, as defined by the Awards Scheme. The entry could be of any size, length or cost. Entrants agree to their entry being made public in a permanent repository at the Open University’s discretion. Applicants must be available to attend the awards ceremony at the Open University’s Walton Hall campus; see above for details. Entry to the competition is now open. Closing date for applications: 18th December 2014 at 5pm. Late entries will not be accepted. We will only accept entries that are made on the Entry form. These awards seek to recognise outstanding contributions which meet the needs of publics, user communities and other stakeholders by addressing the aims of the University’s Research and Scholarship strategies. Providing innovative engaged research opportunities to effect change, or mutual benefit. Contributing to positive change with respect to engaged research practice, policy or procedure. Developing publics, user communities and other stakeholders engagement skills and competencies. Illustrating engagement with professional development activities. Engaging with and responding to the diverse needs of publics, user communities and other stakeholders. Pingback: Impact of Social Sciences – Towards an open research university: creating the conditions where engaged research can flourish.